It is an honour for me to talk to you today about OECD’s role in global economic governance. It is more than 70 years that world leaders established the first such system, the Bretton Woods Institutions. It has since weathered its share of turmoil, yet the time since 2008 has certainly proven particularly challenging – and changeing. The crisis hit advanced economies hardest and longest. Emerging countries were far less affected and proved instrumental in rebalancing the economy. Their strength, share in world output and vital importance to the global economy shifted even clearer into focus. So the need for prompt, decisive, coordinated and collective action by governments and financial institutions to save the global financial system at this point no longer allowed for old imbalances. The crisis led to a – still ongoing – adaptation of global roles and institutions. 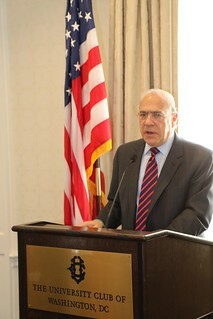 16 April 2015 - Angel Gurría, Secretary-General of the OECD speaking at the Executive Council on Diplomacy in Washington, D.C. The emerging of the G20 as the “Premier Forum for International Economic Cooperation” among them is maybe the most perceivable outcome. It is not exaggerated to say that the crisis gave birth to a new, much more balanced, economic and financial multilateralism that proved – at least at the start – fairly effective. At the height of the crisis the decisions taken at the G20 proved critical in stabilising the global economy and avoiding outright collapse of the international financial system. Yet, soon seven years will have passed “post-crisis”, and challenges are still manifold and complicated. To revive global growth and put the global economy on a sustained footing, leaders worldwide want to rely on sound analysis of reliable data, well-founded and broad-based policy recommendations, effective institutions and well tested co-operation mechanisms. The OECD fits the bill. It provides evidenced-based analysis to advise governments on policy design and implementation as well as soft and hard international instruments to promote a rules-based global economic environment. The OECD is especially tailored to identify and assess emerging challenges and develop tools to address them. The strong political clout of the G20 and the sheer necessities of the crisis helped leverage the OECD’s technical and institutional expertise globally. This is no better exemplified than in the field of international tax issues. Since 2009, OECD has helped G20 leaders and Ministers of Finance build the case for decisive action against non-cooperative jurisdictions and for improved transparency in the tax area. The political agenda has been successfully translated into the powerful institutional mechanism of the OECD-hosted Global Forum on Transparency and Exchange of Information for Tax old site which has ensured tremendous progress in the area of international exchange of tax information on request. Taking their goals further, G20 and OECD will see the new global standard for the automatic exchange of tax information – designed by the OECD – implemented from 2017-2018 onward. So far, these efforts have helped to generate additional revenues of around 37 billion Euros to public treasuries in the last five years. Also, about 3,000 new agreements incorporating exchange of information on request have been concluded since 2008. The global fight against tax avoidance has followed suit: Since 2012 the OECD and G20 have worked together on the issue of tax avoidance by multinational enterprises by addressing aggressive tax planning. A 15-point action plan to prevent base erosion and profit shifting, BEPS, will be presented to G20 Finance Ministers this coming October, followed by the elaboration of a framework for its implementation. While the tax agenda represents G20-OECD cooperation “at its best”, the OECD has also contributed to most G20 strands of work since, not least in monitoring progress on commitments. The OECD supports each G20 presidency closely, next year with one of the most important non-OECD countries, China, at the helm. The OECD’s expertise on new and sustainable growth extends horizontally across fields of trade, employment or investment into its basic prerequisites of equality and inclusiveness. Growth is e.g. dampened by growing income inequalities in G20 and OECD countries that prevent the full potential of skills to be developed and absorbed into the labour market. The OECD also works with partner organisations: with the IMF on the national growth strategies and the structural part of the framework for strong, sustainable and balanced growth – we were the linchpin behind the definition of the G20 Brisbane 2% additional growth ambition by 2018; we are partnering with the ILO on employment, and substantiated the G20 objective of reducing the gender gap in labour market participation by 25% by 2025; we are working with FAO on food security and jointly designed the innovative Agricultural Market Information System (AMIS) set up by the G20 to stem food price volatility. We are cooperating with the World Bank and others on development; with the IEA on fossil fuels, and with the WTO and UNCTAD on monitoring protectionism in the areas of investment and trade. This way, we are instilling more coherence in the international economic architecture and making our action more collective and therefore more effective. To secure its role and relevance for the future, OECD maintains and fosters strong global relations. Through work with the G20 the OECD strengthens its ties to their non-OECD members. Agreements with Indonesia and China have been concluded, establishing a whole-of-government mechanism for joint priorities. We are aiming at similar agreements with India, Brazil and South Africa given their role as our “Key Partners”, supporting them to better adopt global standards and have their national policies and commitments assessed by OECD. With other important players we engage through Country and Regional Programmes or Global Fora. Country Programmes are used as a tool to support the domestic reform process of important regional players and bring them closer to OECD standards. We currently launched such efforts for Kazakhstan, Morocco and Peru. Also, Southeast Asia and Southeast Europe Regional Programmes are being implemented, the MENA Initiative and the Eurasia Competitiveness Programme are ready to be extended. Engagement with African countries is expanding. New members are being welcomed: In May 2013, the OECD Council decided to launch accession discussions with Colombia and Latvia. Just this month, it also invited Costa Rica and Lithuania. In 2010, Chile, Estonia, Israel and Slovenia became members. The OECD will continue to support the global agenda and collective policy actionby joining forces with our Member and Partner countries, and with other international organisations, initiatives and global governance fora like the G20 and G7 or APEC, ASEAN, SEGIB or others. It will also continue to enhance its global character by furthering its expertise on and work with emerging economies and developing countries as well as by “socializing” and mainstreaming its standards and instruments beyond its membership - thus enhancing their relevance and effectiveness. Ladies and Gentlemen, at the core of the mandate given to the OECD by its founding fathers in 1961 was their determination to promote by “consultation and co-operation […] the highest sustainable growth of their economies and improve the economic and social well-being of their peoples”. In the face of a radical change in the global economic governance, 54 years-young OECD is playing an increasingly central and useful role in designing, developing and delivering “better policies for better lives”.